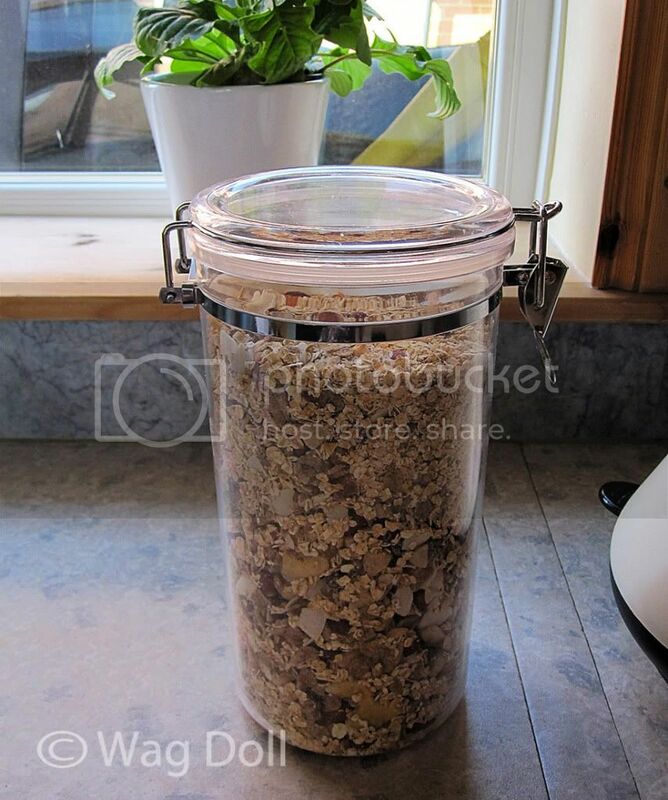 Toasted Oat and Nut Muesli with Dried Fruit Recipe - Eating Clean & Looking Lean. The Wag Doll Protocol. Eating Clean & Looking Lean: Easy Breakfast Recipe. Normally when I'm eating clean I have porridge for breakfast, oats cooked with half semi-skimmed milk and half water. It's warming for winter mornings and keeps you full until lunchtime. But as the weather gets warmer and for those mornings I don't have time to cook porridge, I wanted to find an alternative. Lets not beat about the bush here, most store bought breakfast cereals are the devils food! They are extremely high in quick release carbs, most have added sugar, salt and additives and the ridiculously small 30g serving they recommend would have me fainting from hunger before I'd even got my coat off at work. There are some healthier choices in the muesli and granola supermarket aisle, but it seems the healthier the cereal...the higher the price. 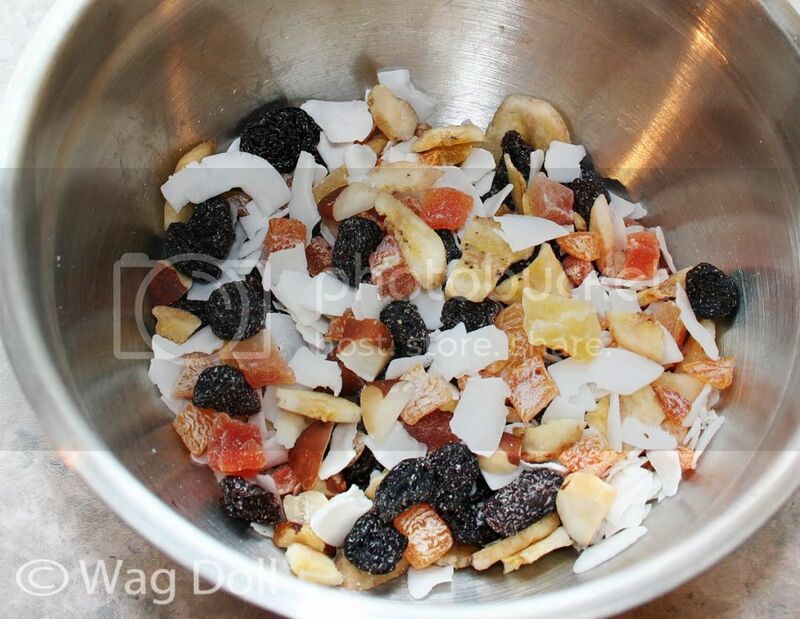 So I looked into making my own version "Wag Doll's Toasted Oat and Nut Muesli with Dried Fruit." Oats are pretty much the only carb food that I eat regularly when eating clean. They are low on the Glyceamic Index meaning they release their energy very slowly, keeping you feeling full and avoiding a blood sugar spike, which is the aim of the The Wag Doll Protocol Eating Clean regime. Oats also contain fibre, protein and help lower cholesterol levels. Combine with nutritious nuts and dried fruit for a super healthy and filling breakfast. 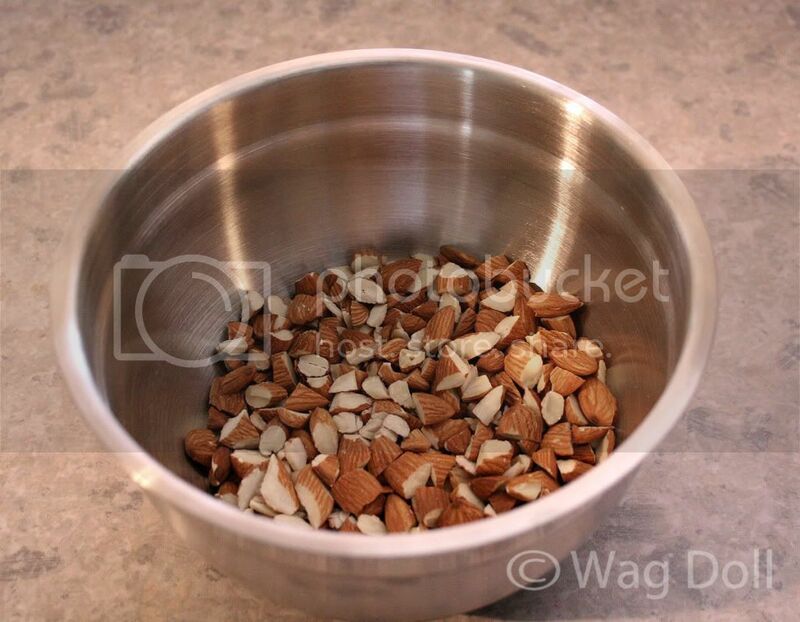 Roughly chop the almonds, you can use a food processor but as I don't have one I just manually chopped them. Heat the oven to a moderate temperature (160degrees Celsius/320 fahrenheit). 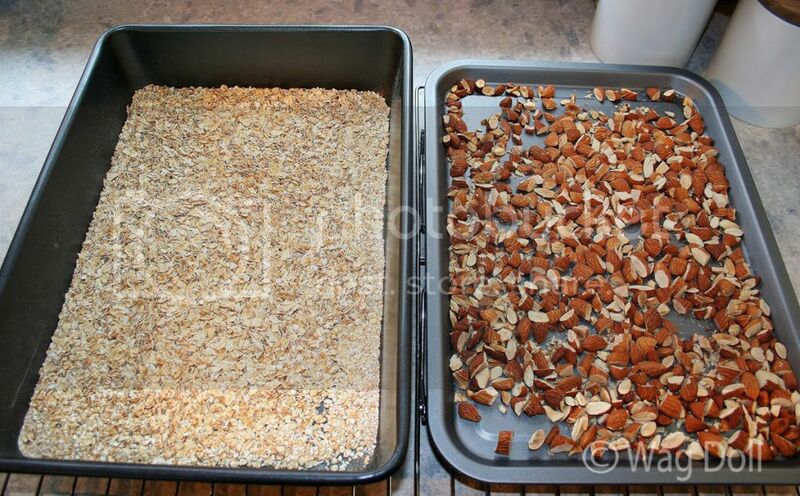 Spread some of the oats and nuts on ungreased baking trays. Spread in a thin layer and cook in the oven for approx 30 mins, stirring regularly. Do not allow the oats/nuts to burn. When the oats & almonds begin to turn golden and smell gorgeously nutty they're ready. Repeat for the remaining oats & nuts. Leave to cool. 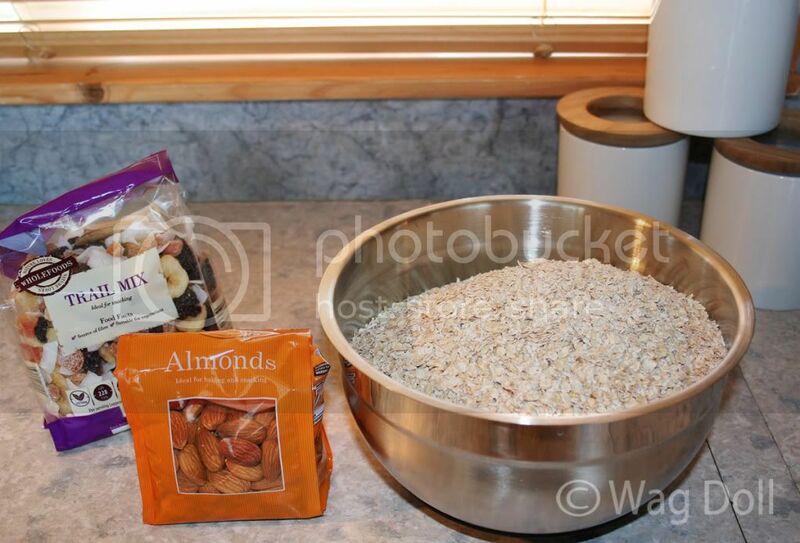 When cool combine the oats and nuts in a large bowl. Chop the dried fruit mix if necessary. I used 'Trail Mix' - a mix of dried apricots & papaya, sultanas, banana chips and Brazil nuts. 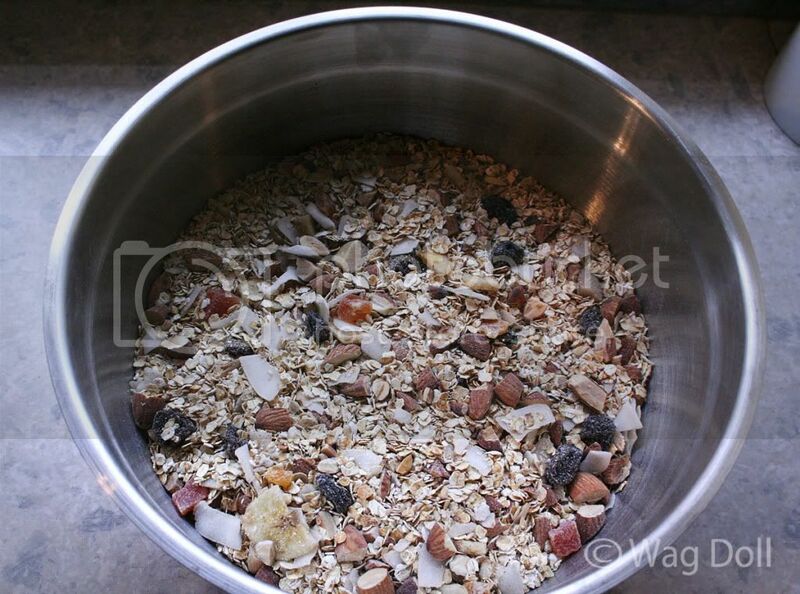 Add the dried fruit to the oat & nut mixture and your home-made muesli is done. You can obviously use other nuts but I chose almonds as they contain valuable amounts of vitamins and minerals, and while, like all nuts, they are high in fat, in the case of almonds it is mainly mono-unsaturated fat which lowers cholesterol and reduces the risk of heart disease. Normally I just guess'timate my portion, but I did weigh a typical serving so I could report back. I tend to have approx 50g and I add semi-skimmed milk. Feel free to add whatever type of milk or milk alternative you prefer. I'd be interested to hear what you think of the dairy substitutes available? Compared to Crunchy Nut cornflakes which weigh in at a hefty 82g carbs of which 35g are sugars (!) per 100g. And a measly 2.5g fibre but 15x times as much sodium. But mathematical equations aside, the typical high carb cereal was my usual choice for many years as it is 'low fat'....I was ignorant of the fact that nutritionally it's empty and I suffered from the blood sugar chaos it causes. Porridge or home-made muesli fuel me for a long day and that includes the The Wag Doll Protocol workouts. Let your breakfast set you up for the day ahead, so 'Eat Clean & Look Lean' lovelies! The museli sounds delicious I think I will try and make some. I am investigating eating clean at the moment and am upping my protein intake as want to build some muscle. I have just changed milk from cows to almond (which my local supermarket Tesco has just started stocking) whilst it doesn't contain as much protein as cows milk it is low in fat and calories and free of saturated fats. Whilst I am not sure about it in my tea (which I am trying to switch to green anyway) it's delicious on cereal. Totally agree about the evils of cereal, trying to find one that isn't laden with sugar whilst still being tasty for the kids is a total nightmare. How is the fitness regime going?